Face-lifted 2014 VW Touareg revealed | What Car? The 2014 Volkswagen Touareg gets refreshed styling and a more streamlined engine range as part of its imminent face-lift. Volkswagen has revealed details and pictures of the car ahead of its global launch at the Beijing motor show later this month. Although VW says the front end has been completely redeveloped, it will be familiar to owners of the current car. However, it has new, larger bi-xenon headlights as standard, a new grille with four chrome slats (it had two previously) and a redesigned lower bumper and spoiler. The foglights have also been redesigned. At the back, it gets a redesigned rear bumper that has the LED foglights integrated into it. There are also two new styles of optional 18-inch and 20-inch alloy wheels, and five new colours. Inside, it gets new leather colours, new white lighting and chrome details on the dash. Google Earth mapping and Google Street View will feature on the satellite-navigation system. The Touareg's engine range has been trimmed, with only two diesel engines to be offered. Both are 3.0-litre V6 TDIs, with 201bhp or 254bhp. The V8 diesel and the V6 petrol hybrid have both been dropped. Both V6 diesel engines now come with stop-start and battery-regeneration technology as standard, to trim emissions and boost economy. The eight-speed automatic gearbox also comes with a coasting function, which decouples the engine from the gearbox when the driver removes their foot from the accelerator pedal. These changes mean the 201bhp model's emissions are down 10g/km to 174g/km, while economy is 2.4mpg better at 42.8mpg. The 254bhp version's emissions are cut by 11g/km to 178g/km, while economy is up to 41.5mpg – an improvement of 2.3mpg. 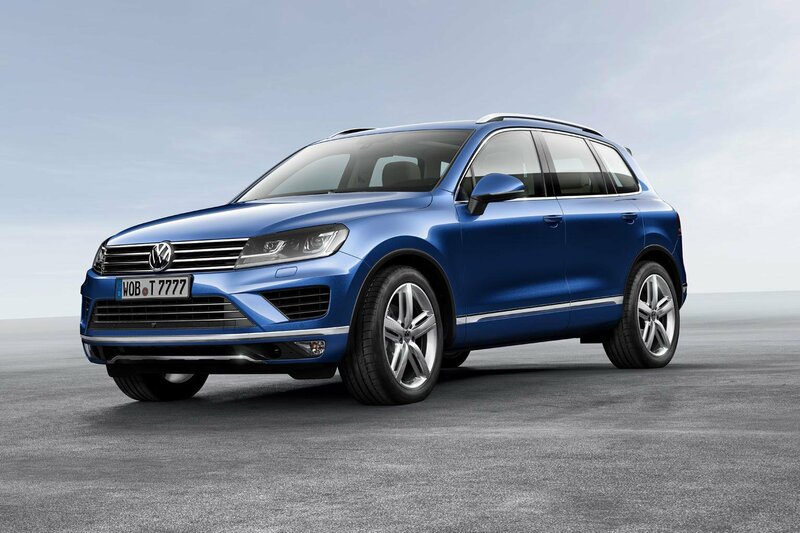 The new Touareg will be available to order from August, with the first cars being delivered in November. There is no indication on the car's pricing, but it is not expected to rise dramatically over the current version's, which starts at £42,110.